First of all, I have to mention the Attractions Ontario website which has a great selection of coupons for almost every attraction in Ontario (even African Lion Safari!). Check it out before you head for your weekend excursions. Salsa On St. Claire – participate in a showcase of Latin life and flavour. Art In the Park, an annual art show, is taking place at the Markham Museum which offers 25 acres of parkland including an orchard and heritage gardens. See mills, re-created businesses and family homes. Enjoy a personal tour and then stroll the village. Bring a picnic or pick up food at one of the many local establishments. Kidsfest on Centre Island – this may be a reason to go…or to stay away because of the crowds. Your call. There is also a bizarre public napping event (yes, as in take a NAP) on Queen St. but I don’t think us parents can pull it off. We would just ruin it for everyone else. Book reservations at a restaurant for Summerlicious, July 9th- 25th. If your kids (and husband) are into cars, go see the exotic car show in Yorkville on July 10th, 11:30-5pm. Over 60 Porsches and Ferraris will be showcased. Yorkville, Bellair and Cumberland Ave. will be closed for traffic. Ladies, while your husband and kids swoon over cars, you can go to Anthropologie. If your family wants to try fishing for the first time, this weekend you can do so without a license in Ontario. Read more info on this website. If your kids like trains, enjoy the open house at the Richmond Hill Live Steamers…this is a non-profit live-steam club whose members are dedicated to building and operating scale model steam, electric and diesel locomotives. Yes, people do this for fun. The Toronto Outdoor Art Exhibition is on (probably more enjoyable with no kids). Don’t grandma/grandpa want some quality time with yours? Open Friday-Sunday. Last but not least, Barney is at Ontario Place this weekend. So…the upcoming weather isn’t looking too great, is it? But…we will hope for a weekend that is as nice as today. Get to know High Park – I have never been but have heard about the train, petting zoo, children’s garden and the great playground (see photo above). Free walking tours will be lead all weekend. HarbourKIDS presents a circus festival at Harbourfront for kids ages 5-12yrs. Wonderland is open and there will be fireworks @ 10pm on May 23rd. Go to the Distillery District’s Artisans in the Village Craft show, open Sat-Mon. 10am-6pm. Black Creek Pioneer Village is celebrating Alice in Wonderland! Let your mind wander into this whimsical world and enjoy a lively and interactive stage performance, a fun maze, and lots of colourful characters! This is Ontario Place’s opening weekend. I have to let you know but please don’t join the masses for your own good! Enjoy the Dinosaur Eggs & Babies: Remarkable Fossils from South Africa exhibition at the ROM. You and your family will have the opportunity to see exceptional and rarely-seen artifacts. The exhibition (May 8th – July4th), displays the oldest fossilized dinosaur eggs with embryos ever found, as well as other impressive discoveries never before displayed to the public. Visit Centre Island – Centreville open all weekends in May! Most farms are already open to the public – our family’s favourite is Whittamore’s Farm with its great Fun Farmyard. Highly recommended! Sesame Street Live is playing at Rogers Centre May 21-23nd. Check Ticketmaster for tickets. See the Kite Festival at the Kortright Centre for Conservation. Lots of demonstrations and great family activities! Go on a walk in Toronto through Jane’s Walk – 120 free neighbourhood walking tours in Toronto to pick from. Explore the city, meet the neighbours hear the stories and share your thoughts. No need to pre-register…just show up and take the walk! All walks are free and open to the public. See here for schedule and locations and celebrate our city! Go to the BabyTime Show for everything baby! April 30th – May 2nd at the International Centre. I am not a huge fan of the show because they no longer have a lot of stuff to keep the kids busy and the entrance fee is quite high considering that you are coming to shop… However, if you are expecting a baby, this is a great place for you to see strollers and such. Click here for a coupon for the show. Sunday is Yummy Mummy Day at the Promenade Mall (1pm-3pm). Featuring Kids crafts, makeovers and talks by Erica Ehm. See here for more information. See Beauty and The Beast at the City Playhouse Theatre in Thornhill, Sat. & Sun. 2pm. Celebrate Earth Day at Downsview Park on Sunday, 11am-4pm, featuring environmentally-friendly exhibits, activities such as tree planting and entertainment for the whole family. If it rains…Woodbine Centre’s Fantasy Fair is celebrating 25 years with a buy-one-day-pass-get-one-free promotion on sunday, April 25th. Take part in Nature Month related activities at the ROM. Did you know that the ROM also hosts special sleepovers? Info available here. For children 10+, the play Hana’s Suitcase is playing at the Lorraine Kimsa Theatre (Sunday, April 18 – May 21st). The story of Hana’s Suitcase can be a good introduction to the Holocaust theme for older children. The Ontario Science Centre is now running a special Harry Potter Exhibition. Celebrate Earth Day at the Toronto Zoo on Saturday, 10am – 3pm. Enjoy a party for the planet. If you are a teacher, Sunday, April 18th is Teacher Day – bring your current OCT card and receive free admission for yourself and another adult! The Toronto International Film Festival for Children is starting this Saturday. Sprockets will present a selection of high-quality films, special guests and on-site activities guaranteed to engage, inform and inspire young minds. The festival will offer a selection of features and shorts for young people ages 3 and up. If you want to be outdoors with your kids, Halton Conservation has a special weekend program for kids called Tiny Treks. Appropriate for ages 3-7, enjoy crafts and kid friendly treks as you explore Mountsberg’s birds, pond, forest and barn yard. Mountsberg Conservation area is in Campbellville, click here for directions. Come to the McMichael Gallery in Kleinburg this Sunday for Daffodil Day. Flowers and celebratory traditions will be featured. Every child will take home a daffodil for someone special. On Saturday and Sunday of Easter weekend (10am – 4pm), join Spring Ridge Farm’s Easter Adventure! Egg Hunt with the Easter Bunny, puppet show, pedal tractors, wagon rides & farm tour, and more! Admission for the Easter Festival is $9 per person ages 2 and up. Join the Easter Eggstravagansa at the Toronto Zoo. Yes, it’s open! Participate in a traditional egg hunt in the Casa Loma gardens, Pre-registration required. On Sunday, the Toronto Beaches Lions Club is having their annual Easter Parade. The Toronto Beaches is a great place to visit any day this weekend…great playground, lovely boardwalk, bring bikes! Kortright Conservation Centre (Woodbridge) is still holding their annual Maple Syrup Festival. This is a fun festival with all kinds of activities, wagon rides and ponies. Come early, otherwise the car queue to enter the parking area can get really long. As well, bring your own sandwiches and snacks because their food selection is limited. Picnic tables are available outdoors. Click here for a schedule of events. The Toronto Storytelling Festival has some great sessions for families this weekend at locations such as The Bata Shoe Museum. Hearing a story from a professional storyteller is a very special experience. Check out what is being offered by clicking on the tab that says ‘festival day-by-day’. Maple Syrup? Kortright Conservation Centre (Woodbridge) is still holding their annual Maple Syrup Festival. This is a fun festival with all kinds of activities, wagon rides and ponies. Come early, otherwise the car queue to enter the parking area can get really long. As well, bring your own sandwiches and snacks because their food selection is limited. Picnic tables are available outdoors. Click here for a schedule of events. Wanna bake Matzah? I have never been to Dufferin Grove Park, but apparently, there are outdoor ovens there and you can join their 12th annual Matzah Bake on Sunday (12pm-3pm). Can you and your family mix, kneed, roll and bake Matzah in 18 minutes or less? $5 suggested donation per family. Still too chilly to be outdoors? A 90,000 sq. ft. INDOOR BIKE PARK recently opened in Markham. There are designated areas for all skill levels. You can bring your own bikes or rent equipment on site. Doesn’t this sound like fun?? Check out the website for more information. Enjoy an Easter Egg hunt at Puck’s Farm, (Shomberg) on Saturday (10am-5pm). There will be a small petting zoo, pony & hay rides and plenty of Easter related fun and games. Enjoy the Maple Syrup Festival at Bronte Creek (Oakville) which includes a wagon ride to a heated pancake house (pure maple syrup, YUM!). Pancakes are extra. Costumed interpreters demonstrate how to tap maple trees in order to make maple sugar and maple syrup. See Judy & David live at the City Playhouse in Thornhill with the show titles Red’s in the Hood. Don’t worry if you haven’t purchased tickets in advance, there usually are plenty left if you call the theatre on the day of. Have a pancake breakfast at the Casa Loma with Robin Hood and Maid Marion. Limited tickets available for Sat. March 13th & 20th. Other Robin Hood related events will take place all week for March Break. Go to Kortright Conservation Centre (Woodbridge) for their annual Maple Syrup Festival. This is a fun festival with all kinds of activities, wagon rides and ponies. Come early, otherwise the car queue to enter the parking area can get really long. As well, bring your own sandwiches and snacks because their food selection is limited. Picnic tables are available outdoors. Click here for a schedule of events. There are also special March Break activities at the ROM, CN Tower, Bata Shoe Museum and the Science Centre. For more indoor fun, you can also try Wizard World at Exhibition Place. I haven’t heard any reviews about this…so no guarantees! You’re on your own this weekend as Mamapicks just had a baby boy. I apologize in advance if the site is not updated regularly over the next week. What to do this weekend…Feb. 13th & 14th. Ummm…this one sounds like the weekend winner for our family – Toronto’s Kids-fest, Canada’s largest indoor inflatables show. Located at the International Centre in Mississauga and open Saturday, Sunday and Monday. The $8 admission (for ages 2+) includes three stage shows. 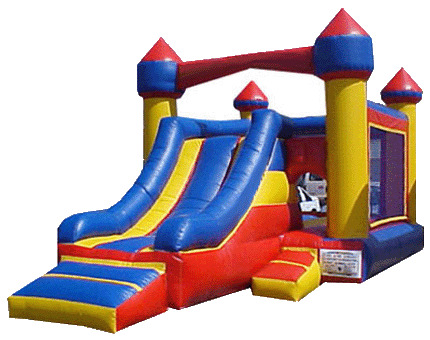 In order to enjoy the inflatables, you must purchase a ride bracelet for an additional $15. A little steep. Click here for location and hours of operation. I am happy to report that a 90,000 sq. ft. INDOOR BIKE PARK recently opened in Markham! There are designated areas for all skill levels. You can bring your own bikes or rent equipment on site. Doesn’t this sound like fun?? Check out the website for more information. The place is open on Family Day. Little House on the Prairie is playing at the Canon Theatre until Feb. 28th. This was my favourite show as a kid and I can still hear the end-of-show music in my head has the Ingles girls run down that green hill. Thank goodness you can’t hear me now. Enjoy skating at the Shops at Don Mills (Donmills & Lawrence). In the Town Square, you will find a great skating oval with lots of families skating outdoors. Mom can shop at Anthropologie. Dad can skate with the kids. Skating is free but you must bring your own skates. There are lockers available behind the water feature. Open Saturdays 9:30am-6pm and Sundays 11am-6pm. Figure Skating performances will take place on weekends this month from 12noon – 2pm (public skating will not be available during these show times). The ROM has a special Family Day Weekend in store Saturday – Monday. The theme is Dinosaurs. Click here for more information on these special family activities. The CN Tower has a special deal this weekend, in honour of the Vancouver 2010 OlympicWinter Games. From February 12-15, purchase two CN Tower Observation Experience tickets for only $20.10 (plus tax)* and save up to 55%! The two tickets can be any combination of adults, children or seniors and include admission to the CN Tower’s Look Out and Glass Floor Levels. Splash N’ Boots are performing on Sunday, Feb. 7th, 1pm & 3pm at The Living Arts Centre in Mississauga. I have never been to their family concert but it sounds like a lot of fun and is appropriate for all ages. If you have been, let me know how you enjoyed the show. Tickets are $20/adult and $15/child. Call 1-888-805-8888 for tickets. Paddywak a percussion concerto for the feet @ the Toronto Symphony Orchestra is appropriate for 5-12 year olds. Toronto Symphony favourite Rob Kapilow’s brand new work features master tap dancer Ayodele Casel and promises to be a performance full of energy and fun. Sat. Feb 6th @ 1:30pm & 3:30pm. A special story telling concert by Robert Munsch on the outdoor (what??) Tim Horton’s stage @ 11am. Admission is free. Click here for the Winterfest brochure and see more about the Kidz Zone offerings. I love that my kids have some friends who were born in the Winter months. Four January birthday parties have shaved 8 hours off of our dreadful Winter weekends. Hurray for winter babies! Visit Fantasy Fair at Woodbine Mall. We spent the day there last weekend and the kids had a great time at the indoor amusement park which is made to look like a Victorian village. There is an antique style carousel, indoor ferris wheel, bumper boats and cars, express train and more. There is also a soft play village with 3 levels and lots of slides. Open Sat. & Sun. 11am-7pm and someone just told me that if you come for the last hour, ride tickets are half price. Go to The Wave Pool (Richmond Hill) or any other indoor pool. Keep the family active and healthy. Send your husband. Visit the McMichael Gallery in Kleinburg on Sunday, 11am-4pm for an Inuit performance and drum making by an Iqaluit artist. Make Inuit-inspired prints and tour the special exhibition, Nunannguaq: In the Likeness of the Earth. Visit the The Bata Shoe Museum. On Saturday afternoons (11am-4pm), join Saturday Shananigans as you and your family explore the galleries and make shoe-themed crafts. On Paint-A-Clog Sundays (12pm-4pm) visit the museum and paint a mini-clog, try on shoes and explore the galleries. A clog costs an extra $1. These weekend family activities are recommended for ages 3-9. Have fun!